We may still hold the record for the longest cupcake kebab, but I am happy to see that people like Odonata98 are still making them. Not much better than red, white, and blue cupcakes with marshmallows in between. Have a great holiday weekend with some Fourth of July Kebabs! To make: Make white cupcake mix. Add blue food coloring to 1/3 of the batter and red food coloring to 1/3 the batter. Make mini cupcakes with the three batter colors. Frost each cupcake and top with star sprinkles. For the marshmallows, dip the bottom 1/3 of the marshmallow in a shallow bowl of water, then dip the wet part of the marshmallow in red sprinkles. Repeat for the other end of the marshmallow with blue sprinkles. 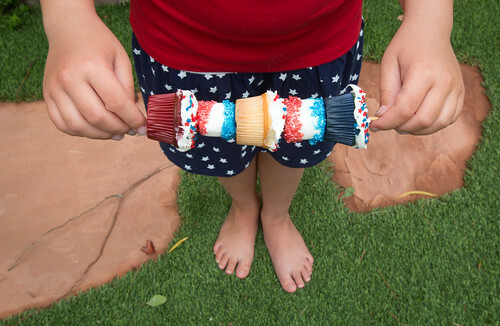 To ensemble, stick a kabob stick through three cupcakes and two marshmallows.